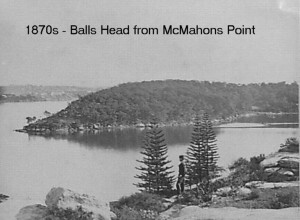 Last Ice Age – 1788 The oral history of the Cammeraygal people of the Kuringai tribe tells of the inundation of the valley by rising waters to form the peninsula they calledYerroulbine, but now known as Balls Head. The people lived on the shore and fished in the bay. One of their enigmatic carvings of a large fish and other figures can still be seen 100 metres from the development site. 1788 – Late 1800s The local people became progressively dispossessed. 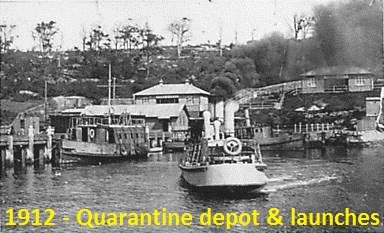 Alexander Berry built a wharf in the western arm of Berrys Bay to unload his ships bringing produce from the South Coast. Convict labour was used to construct a four storey warehouse. With the passing of time the land changed usage, and the Rag and Famish hotel used the warehouse as a distillery. 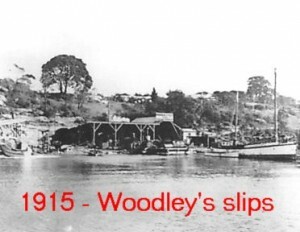 The NSW Torpedo Corps was established on the site and built a slipway for their boats servicing seabed mines laid in the outer parts of Sydney Harbour. 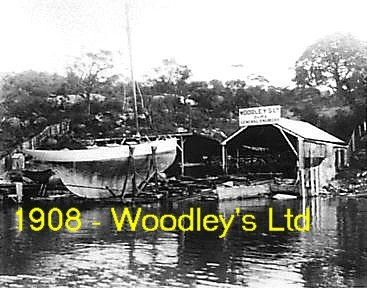 1908 – March 2011 Woodley brothers engineering, shipyard and (from 1968) marina business operated in the western arm of Berrys Bay, building some vessels and servicing innumerable others. 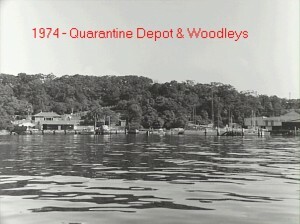 1912-1988 The Quarantine Launch Depot was established, with refuelling facilities and houses for the crew of vessels Pasteur and Jenner which met incoming ships and ferried sick passengers to the quarantine hospital at North Head. 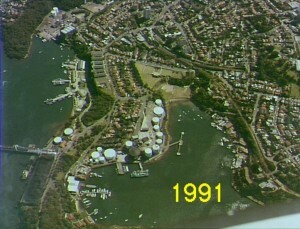 In 1988 it was transferred to the Australian National Maritime Museum as a site for maintenance of its heritage fleet. The site is currently administered by Government Property NSW with the two houses under rental. 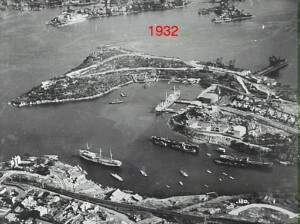 1920 – 1994 – Oil storage operations in western arm of Berrys Bay by Anglo-Persian Oil, then Commonwealth Oil Refineries, and finally BP. The old warehouse was demolished and its convict hewn stone used to build the bund wall which still exists. 1990s – BP, Coal Loader and Caltex leases were coming to an end. In 1993 State Government planning study recommended 387-unit medium density dwelling subdivision on BP site. Community campaign for the sites to become public open space. 1997 – Success! Premier Carr scrapped plans for residential subdivision of the former BP site and dedicated it to public open space, along with the nearby Coal Loader and Caltex depot sites, setting aside one hectare of the BP site for continuation of ‘waterfront industrial’ uses. 1999 – Council, NSW Government and other stakeholders agreed on a Masterplan for those sites. 2005 – Carradah Park opened on the former BP land (minus the one hectare set aside for ‘waterfront industrial’ uses). 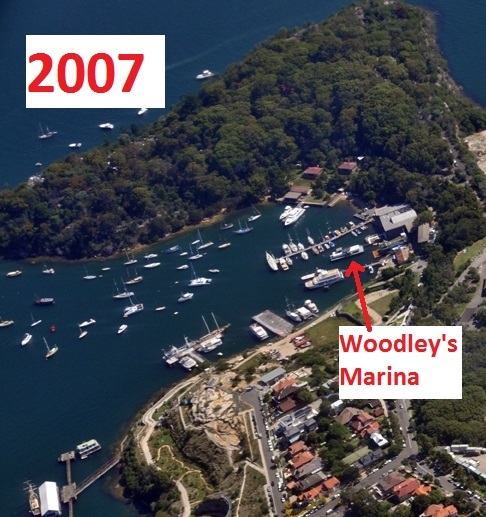 Dec 2007 – NSWMaritime called for tenders for development of a maritime precinct on the 1 hectare of former BP land set aside for ‘waterfront industrial’ plus the 0.6 hectare Woodley’s site. $40 million development – effectively a Harbourside business park with marina. Major commercial retail 2-3 storey development, 5 storey offices, 4 times more office and shop space than permitted under planning controls. 60 boat dry stack storage facility in a massive new building encroaching on bushland and sandstone embankments. 92 boats on water for boats up to 30 metres. Under its controversial Part 3A provisions the Labor Government was to be the consent authority. Sep 2009 – Waverton Precinct, with support of Council and local State member Jillian Skinner, launched Save Berrys Bay campaign against the massive over-development. Oct 2010 – Public Meeting on site. 300 attended. Jillian Skinner promised to “halt and go back to drawing boards” if the community stopped Labor committing to lease before upcoming election. March 2011 – Change of Government, with agreement for lease still unsigned. March 2011 – Woodley’s ceased operations. June 2011 – Coalition Government repealed Part 3A provisions, thereby effectively killing off the Meridien proposal in its 2009 form. Increase in Water Area from that in the 2007 tender specification to allow more boats on water. (We calculate around a 30% increase in the Water Area). July-September 2013 – Developer conducted three Community Reference Group meetings with developer-appointed stakeholder and community representatives, including from Waverton, Union and Lavender Bay Precincts. May 2014 – Developer has not yet lodged a Development Application with North Sydney Council but has foreshadowed lodgement in early June 2014. September 2016 – Berrys Bay Marina Company contacted Council regarding a new DA they planned to submit. In their preliminary information it appeared that changes included removal of the Dolphin Wharf area from their submission, but an increased number of boats in the western arm of the bay, with one or more of the proposed arms being longer than previously. April 2017 – No further action has occurred in the public space during the ensuing 6 months to the date of this update. This is despite appeals to the Premier and the Minister for Roads, Maritime and Freight to have the process abandoned and to call on the Greater Sydney Commission to carry out a detailed planning process which could properly inform future plans for the area.